We have many FREE services that set us apart from the big chain pharmacy's. 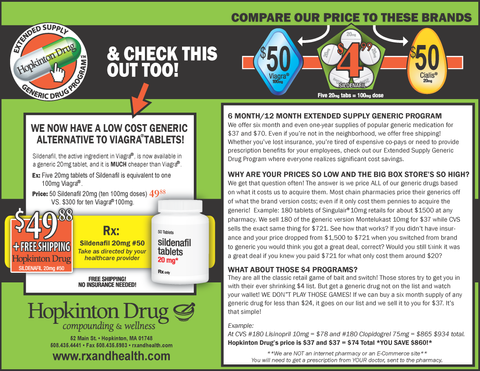 As a Hopkinton Drug customer we encourage you to take advantage of these convenient services. Hopkinton Drug will be one of the first pharmacies in Massachusetts to offer take-home opioid overdoes reversal kits (naloxone). The loved ones of someone struggling with addiction can come to our pharmacy without a prescription and purchase one of these kits. In the even of an overdose, naloxone spray is administered into the nasal cavity of someone suffering from an opioid overdose. This can buy valuable time while waiting for first responders. Naloxone nasal sprays have saved hundreds of lives in the hands of EMTs and police officers. We are proud to make these kits available to the loved ones or those affected by opiate addiction. 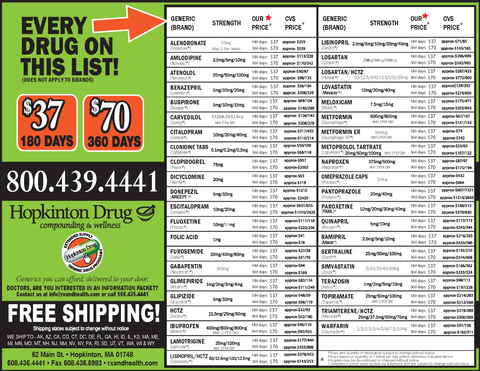 Hopkinton Drug is dedication to helping patients keep organized and adhere to their prescription medication regimens. Medication synchronization schedules a patient's prescriptions to automatically be filled on the same day each month. What are the benefits of Medication Synchronization? 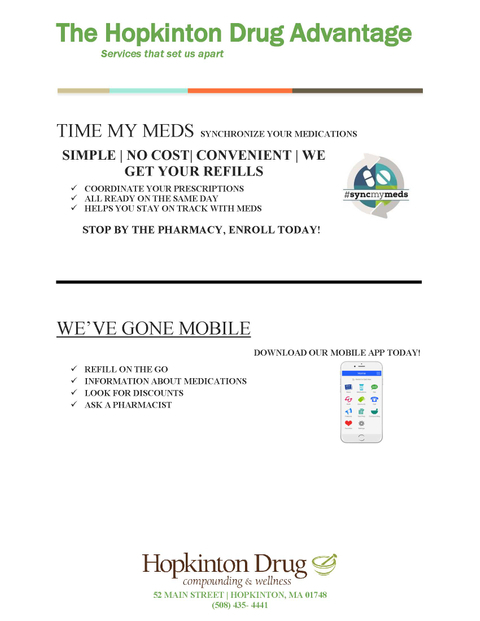 Medication Synchronization reduces your trips to the pharmacy. It also relieves worries of missed refills or running out of your medications. Our program allows your Hopkinton Drug pharmacist to work closely with you to help you stick to your medication regimen. Hopkinton Drug is one of few pharmacies using a comprehensive, automated medications synchronization system. Signing up is simple and convenient! Hopkinton Drug has Immunizing Pharmacists on staff, trained through the APhA National Certificate Program - Is that always the case? We can administer the influenza vaccine to assisted living residents, businesses, clubs, and organizations. We also provide pre-registration to make your in-house flu clinic run more smoothly. Set a date and time with one of our Certified Immunizing Pharmacists and let us come to you! Our Lecture Series are free community events with highly qualified speakers from all over the country. Hosted at the Hopkinton Senior Center, these lectures are open to the public but pre-registration is recommended to ensure a spot.